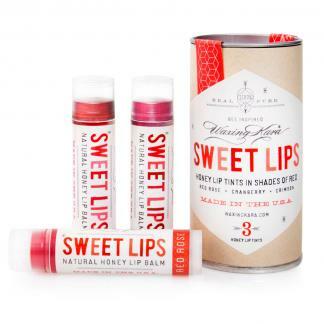 Made with honey, plant oils, and beeswax, our Lip Balm Tints Trios give your lips a deep dose of moisture and a light kiss of color. Free from petrochemicals, artificial flavors+fragrances, and GMOs. 92% organic and cruelty-free: never tested on animals, and free from carmine colorants. Perfect for stowing away in your makeup bag or purse, our Trios come in a paper tube for easy transportation. Available in shades of red, plum, and bronze, with new colors coming soon! Formulated with minerals for a kiss of color, our Honey Lip Balm Tints Trios soothe the lips with a 92% organic blend of plant oils, honey, and beeswax. Made in the USA without petrochemicals, GMOS, and artificial colors+flavors.